Where do the weekends go? It seems like just yesterday (or the day before yesterday) that the weekend got here. I always look so forward to the weekend, but then it's gone in the blink of an eye. Friday night we went to Easton to look for some much needed shoes for C. His, after all, have been around since high school. Now that he's got a big law job (and holes in the bottoms of his shoes) it was time to get new ones. I'm happy to say we were in and out of DSW in 10 minutes. After the dreaded shoe shopping (for some reason C hates it more than the Cubs) we had dinner at Five Guys Burgers and Fries. YUM-O! From there I went to look for some more work pants at gap (hallelujah for Gap making work pants) as it's the only store that makes pants long enough for me. Other stores that were visited include Crate and Barrel, Williams-Sonoma, Pottery Barn, J.Crew, Banana Republic, Express, and The Limited. I only came out with purchases from Gap and the Limited. C spent the entire time in Barnes & Noble. I tell ya, Les Wexner's people were thinkin' when they put that store there. After I collected Charles from the history section of B&N we headed to Starbucks for some dessert. After we returned home we finished up the evening with some HIMYM Season 4 (we were almost done). Saturday afternoon we went to Buca di Beppo and the Blue Jackets game for Emily's 22nd birthday. Dinner was delicious and the game was very good. 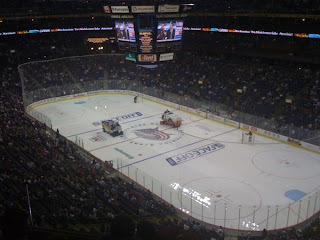 Aside from the win, my favorite part was the Zamboni! Apparently you can ride on the Zamboni while they resurface the ice. We also managed to finish HIMYM. Now we are all caught up. Except for last Monday's episode, which did not have the voice track on the original airing. It has since been re-aired, re-DVR'd, and is waiting patiently for us in the little DVR box. Sunday was the usual, church and McDonald's. I had to attend a couple of events for work. Once that was done I returned home in time to see the Bengals beat the Browns in OT. Nothing seems to be going Cleveland's way. If the Indians and Browns' seasons are any indication of how the Cavs will be, it's probably safe to say we'll be LeBron-less next season. I'm off to figure out how to win a ride on that Zamboni. Then I'm going to beg Charles to go out tonight since I don't feel like cooking. Wish me luck!